I was outraged to learn last month that a handful of U.S. senators were again trying to shred the laws that protect Appalachia’s waters — but I wasn’t surprised. They were mostly the same folks who continuously criticize and accuse the Environmental Protection Agency of waging a so-called “war on coal” for simply fulfilling its mandate to protect America’s natural resources. Appalachian Voices and many others mounted an immediate and vigorous citizen backlash, and the senators’ plans were fortunately defeated. But it reminds us that many of our “representatives” on Capitol Hill and in our state capitals don’t always represent our best interests, and that we need to look out for ourselves. It is in this spirit that Appalachian Voices is proud to join with SkyTruth, a technology innovator in environmental advocacy, to launch a new tool that helps Appalachians stand up for clean streams and healthy drinking water. 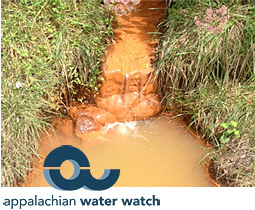 The Appalachian Water Watch Alert System enables people to report incidents of water pollution — such as spills, fish kills and discolored water — to government agencies and to others in the community who may be affected. Citizens can report online or by dialing a toll-free hotline (1-855-7WATERS), and can do so anonymously if they prefer. The Alert System will help build a big picture of trouble spots in our region, giving citizens, regulators and companies the hard data to address them. I encourage you to check out AppalachianWaterWatch.org and tell your family, friends and neighbors.